Evie and Ollie were fighting as per usual, however, this time it ended with Ollie’s hand getting stuck in the hinge side of a closed door. I was close by and I swooped in when I heard the screaming. It looked bad at first, but luckily he didn’t sustain any permanent damage. This is something that is of particular concern for me. When I was in college, I saw a man’s finger get cut off when the wind swept through the dorm and slammed the door while his finger was resting on the hinge side. It was a relatively traumatic experience for me (probably for him too), and something that I’m sure I’ll never forget. As you can imagine, this was running through my mind during the whole incident, and I felt the need to impress upon the two of them how dangerous playing with doors could be. 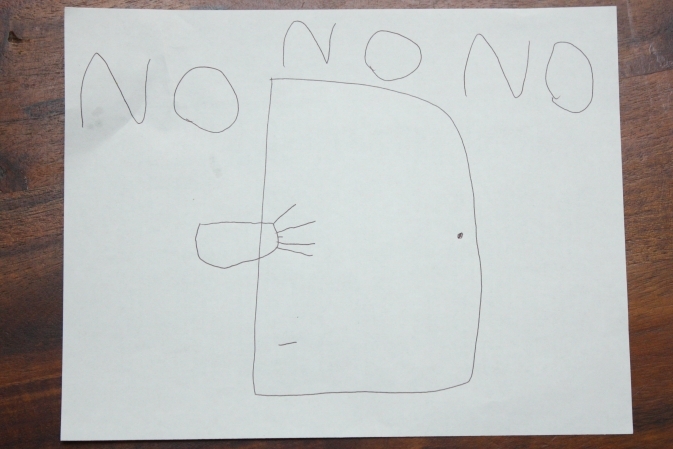 Evie felt really bad about the whole thing and made a series of signs to hang on every door in the house. All of the signs indicate that you should not put your hands in doors, but this was my favorite of them. Notice the severed finger falling to the floor, and the little finger stump left on the hand. Even Ollie aught to know better than to put his hand in a door with a warning like that. Pingback: Quote Monday prefers the written word | Is this thing on?